Often, it is the memorabilia and ephemera of a politician or public figure that offers the most insight into that individual’s life and work. Recently, the staff of the Claude Pepper Library and Museum completed the physical processing of former Governor Reubin Askew’s personal and professional memorabilia, adding a variable trove of new material to the finding aid of the State of Florida’s 33rd governor. From his U.S. Air Force issue belt and garrison cap(he served from 1951-53), to one of his blue collared shirts which he dutifully wore during his many press conferences as governor, these items add an invaluable layer of context to Askew’s already existing collection of manuscript materials that chronicle his time as governor, U.S. Foreign Trade Representative and runs for president in 1984 and U.S. Senate in 1987. Please visit the Claude Pepper Library and Museum website for further information on our collections and potential opportunities for learning and exploring our political collections! Colored pencils used by Reubin Askew during the Florida Senate reapportionment of 1960. When bombs fell on Pearl Harbor in the early morning of December 7, 1941, the picture of America, as has often happened, was changed. Having only begun to shake off the burden that was the Great Depression, the country was largely isolationist and determined to right its own ship, letting the world without handle its second great conflagration within twenty years. As was reflected in the above excerpt from Senator Pepper’s diary however, the country as a whole came to a realization very quickly: the war is upon us and we must fight. The outpouring of support and the subsequent rush to military recruitment offices by millions of Americans was unprecedented, with the nation rapidly mobilizing to prepare for the next 4 years of global conflict. Not every action taken in the wake of the attack on Pearl Harbor was warranted however, as Japanese American citizens of the United States, were taken from their homes and interned in camps throughout the American Midwest and Arkansas. As we remember the 75th anniversary of the Attack on Pearl Harbor, let us reflect on the lives lost that day and in the years that would follow, let us contemplate the day’s significance in the history of not only our country, but the world, and finally let us remind ourselves of ways in which we can honor the sacrifices of those who came before. The Thomas LeRoy Collins papers are housed at the Claude Pepper Library and are available to researchers Monday through Friday 9AM-5PM. American Archives Month is when archivists often take the time to tell the public what it is we do all day and why they should care. However, we’ve never much talked about how it must be for the collections themselves. Here’s a collection-level view of what an archivist does when new materials arrive. When I arrived in the Special Collections & Archives Division at Florida State University, I was a real mess. Parts in cardboard boxes, others in plastic bags; I heard the folks who brought me in say more than once that it was hard to tell which end was which. Since then I’ve discovered that it isn’t always the same with other new arrivals. Some show up completely tidy and ready to help people find the answers to their most pressing questions. Not so with me. I started life out in the College of Communications at Florida State University in 1972 in the office of a young professor named Thomas Hoffer. I wasn’t much at first, but as the years kept piling up, as is the tendency with things, I grew. Exams, course syllabi, professional correspondence and some non-important bits like old blank warehouse club membership applications were just a few of the things that came to represent me after the thirty years I was with Professor Hoffer. Being quite substantial at this point and with the Professor retiring, I needed a place to go. After getting boxed, and bagged up, I was taken to a storage facility not far from the university. 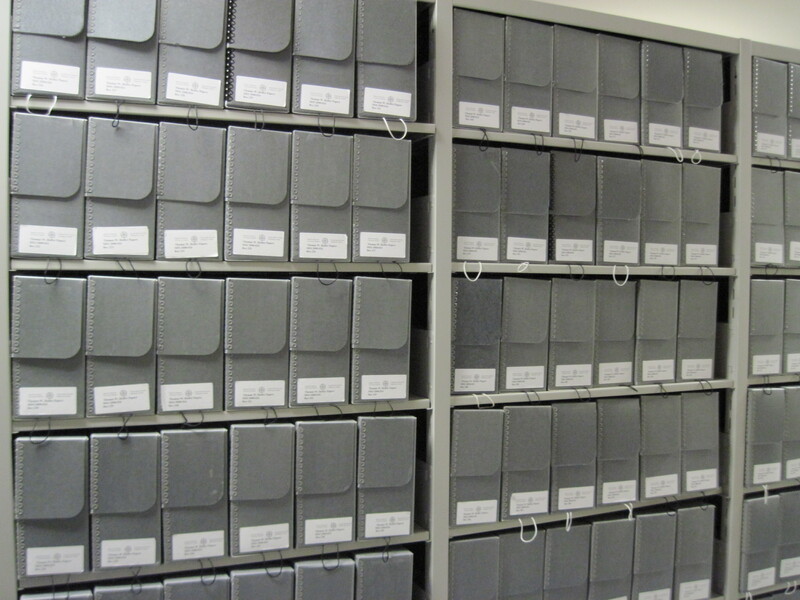 Many archival collections arrive in need of physical processing to ensure preservation. Settling into my new home wasn’t too bad once I got over being constantly lifted up and put down again, though I must say it was a little warmer than I was used to. After a few years had passed, it was decided that I would be donated to the Special Collections & Archives at Florida State University and I became acquainted with some folks that called themselves archivists. That’s when things got interesting. At first they made some initial visits to my storage space to go through my contents, making notes and doing a lot of talking about how much of me there was. After several of these visits, instead of bringing note pads and pencils with them, the archivists showed up with hand trucks, push carts and a van which they used to bring me back to the university. It was a little confusing at first and I’d wondered if there had been a mistake, but eventually, piece by piece I was moved from my storage room back to campus. To be specific, I was moved to an archives. 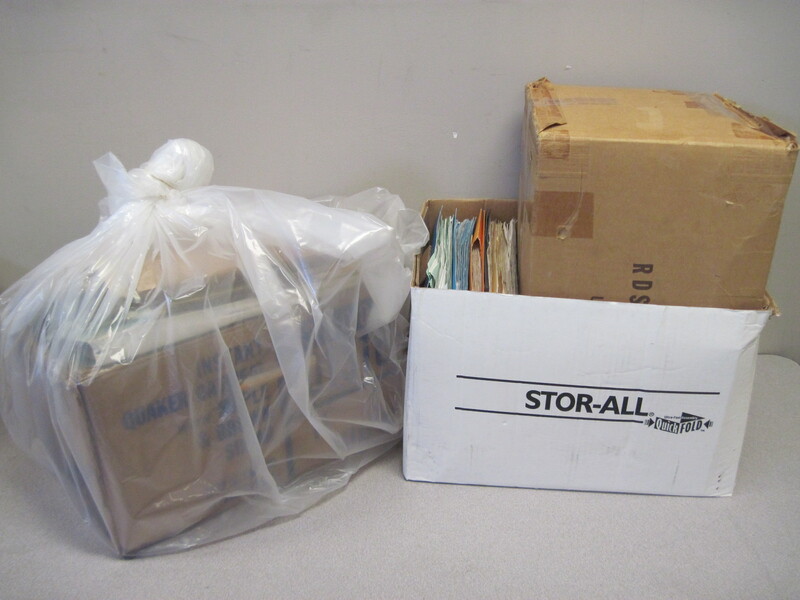 My skepticism started to fade when the archivists and student workers began to remove my essential parts from the musky boxes and plastic bags, and started putting me into fresh new folders and boxes that, by the looks of them, were made specifically for archives. According to the folks who were shifting me around, these new folders and boxes would help in keeping me around for a good while longer. As all of this was going on, all of the non-important bits that I mentioned earlier, like the blank forms and random accumulations such as a bit of reptile skin were removed and disposed of. After about a year and half of this celebrity treatment, my “physical processing,” as the archivists called it, was finished and I found myself in a new home on the shelves of the Claude Pepper Library. Fully processed, the Thomas Hoffer Papers are ready to aid patrons in their quest for knowledge. 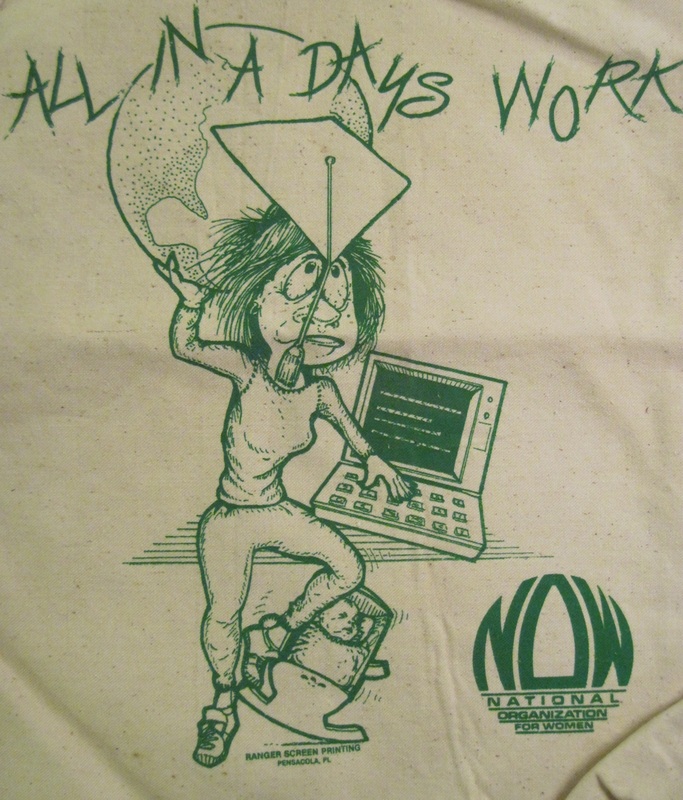 Since then an electronic finding aid, which as I have gathered, is like a road map for my makeup and contents, has been put online by the good archivists and can be found on the FSU Special Collections & Archives homepage (the internet wasn’t around when I got my start, but I highly recommend it!). The finding aid helps researchers like yourself find what you’d need quickly and easily like Dr. Hoffer’s work with his film indexing project or classes he taught on documentary film making. I hope you’ve enjoyed my story and will come visit the Florida State University Libraries Division of Special Collections & Archives to see what our collections are made of. Whether it’s for a project or personal enrichment, I guarantee you’ll find something interesting to learn about and enjoy. From his first day as a United States Senator on January 1st 1937 to within four years of his death in office as a United States Representative on May 30, 1989, Claude Pepper kept a detailed personal account of his life as a public servant. During the summer of 2015, the staff of the FSU Digital Library Center undertook the project of scanning each of Senator Pepper’s 48 diaries and uploading them, as well as their accompanying enclosures and transcripts, into the FSU Digital Library hosted in Islandora. Now, researchers worldwide have the ability to search the diaries online and have access to over forty years of commentary on some of the most significant events of the 20th Century. A page from Senator Pepper’s diary, dated December 7, 1941. A perusal of the Senator’s diaries allows researchers to step inside the mind of one of America’s most active politicians and glimpse firsthand his thoughts on topics ranging from the Lend Lease Bill, the surprise attack on Pearl Harbor on December 7, 1941, the Voting Rights Act of 1965, Medicare and Medicaid, the assassination of President John F. Kennedy, Social Security reform in the 1980s and hundreds of interactions between Pepper and the many influential figures of his day from Eleanor Roosevelt to Tip O’Neil. In addition to this excellent electronic resource, the Pepper Diaries are also available to be viewed in person at the Claude Pepper Library, which opens its doors Monday through Friday from 9:00am to 5:00pm. Today we would like to wish a happy 115th Birthday to Senator Claude Denson Pepper. Claude was born on September 8, 1900 in Camp Hill Alabama, to sharecropper parents Joseph and Lena Pepper, to whom he would remain a devoted son. After graduating with his undergraduate degree from the University of Alabama in 1921, Pepper applied and was accepted to the Harvard Law School Class of 1924. From his youth, Pepper nourished a desire to serve in public office, and after a brief stint as a law professor at the University of Arkansas, he moved to Perry, Florida in 1925 where he established his first law practice. 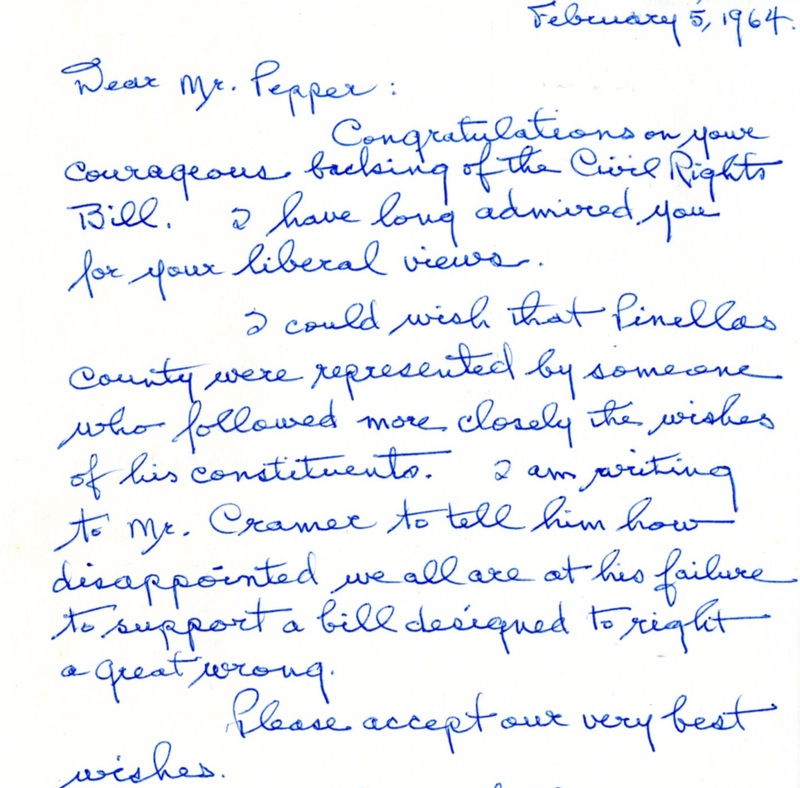 Pepper was a devoted public servant who served the state of Florida for over 40 years as a member of the Florida House of Representatives (1926-27), the US Senate (1936-1950) and the US House of Representatives (1963-1989). During his time in the Senate, he was a proponent of President Roosevelt’s New Deal Legislation and was instrumental in the passing of the Wage and Hour Bill as well as the Lend Lease Act. In the House of Representatives, Pepper served as an impassioned advocate for elder rights, health care and for strengthening and protecting Social Security, Medicare, Medicaid and other government sponsored programs on behalf of millions of Americans. He died in Washington D.C. on May 30, 1989 and was the 26th individual to have lain in state in the U.S. Capitol Rotunda. Bob Hope speaking at Claude Pepper’s 84th Birthday. Tip O’Neill can be seen to the right. Senator Pepper’s collection resides within the Claude Pepper Library at Florida State University and reflects the many of the challenges and changes that took place in American life throughout his distinguished career. Topical strengths within the Pepper Collection include aging, Civil Rights, crime and drug prevention, National Health Care, New Deal Legislation, Lend-Lease, McCarthyism, U.S. foreign and domestic policy, welfare and worker’s rights. During the summer of 2015, the Claude Pepper Library and the FSU Digital Library collaborated to bring the Senators personal diaries to researchers’ fingertips. Scanned by the staff of the digital library, Senator Pepper’s 1937 and 1938 diaries and transcripts are now available to view online in the FSU Digital Library. Over the coming months, the Digital Library will continue to add to the diary collection, one that spanned 48 years from 1937 to 1985. 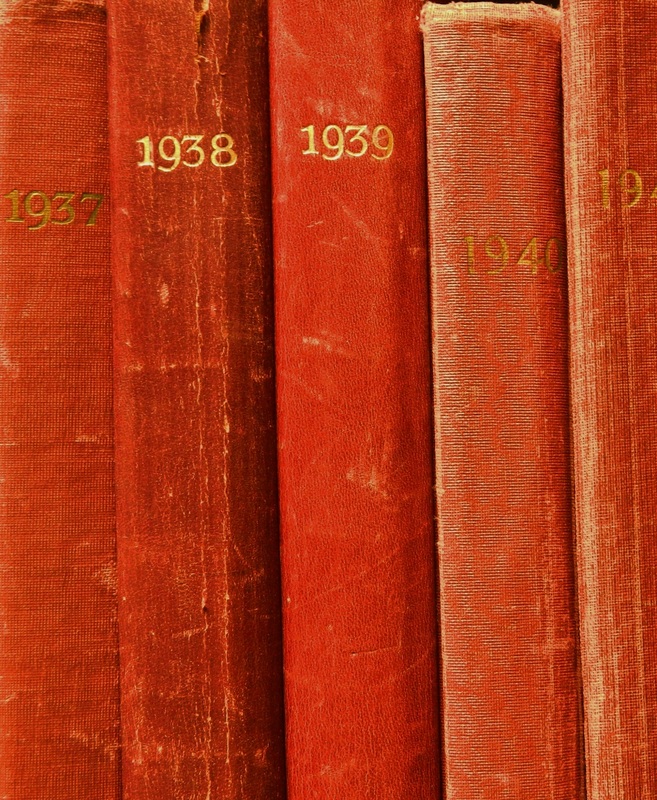 The diaries offer unique insight into one of the more active American politicians of the 20th Century and the 1937 and 1938 diaries are especially unique as they chronicle the young Senators first two years in office; the beginnings of a career that would span over 40 years. Pepper Diaries on the shelf at the Pepper Library. The Claude Pepper Library is open to the public Monday through Friday from 9:00am to 5:00pm. Continue to follow our posts as we continue to bring you more interesting finds from the Pepper Papers as well as the Reubin Askew Papers and the National Organization for Women, Tallahassee Chapter Records. Welcome back students, staff and faculty to another Fall Semester here at FSU! Here on campus and around town, there are some really great locations and spaces for learning and engaging with the past. One space in particular is the Claude Pepper Library at FSU. The Claude Pepper Library was established in 1985 as the official repository for the Claude Pepper Papers, a unique and multi-faceted collection of manuscripts, photographs, audio/video recordings, and memorabilia documenting the life and career of U.S. Senator and Congressman Claude Denson Pepper (1900-1989). Congressman Pepper in his office, ca. 1980. Since the library’s opening over 30 years ago, the holdings at the Claude Pepper Library, located on West Call Street on the FSU Campus, have grown in size and scope. The Pepper is currently home to 17 collections with varying focuses including the Tallahassee National Organization for Women Chapter Records, The Reubin Askew Papers, and The Thomas LeRoy Collins Papers among others. Our staff currently consists of Claude Pepper archivist Robert Rubero and archives assistant Mallary Rawls. The mission of the Claude Pepper Library is to support and advance research, teaching and engagement by acquiring, preserving and providing access to collections dealing with the political history of the State of Florida on national and local levels for use by students, faculty and researchers worldwide. The focus of our current major project is the digitization of the Claude Pepper diaries, which chronicle over 40 years of political involvement through the late Senator’s eyes. An example of memorabilia found in the NOW Chapter Records. At the Pepper Library we also enjoy posting to our Facebook page and enjoy updating our followers through our “Today in Pepper History” posts. More importantly, we offer patrons a firsthand experience with primary source materials from a variety of creators, all giving a glimpse into the political landscape in the State of Florida with a range of over 75 years. The Pepper Library has regularly hosted archives training sessions, class tours and guest lecturers and plans to continue these events in the future. There is also a museum component located in the Pepper Center which chronicles the life of Senator Pepper and is based on his book, Eyewitness to a Century. Stay tuned for future blog posts as we bring you more great examples from our collections here at the Pepper Library! Last week, on July 2nd, the Civil Rights Act of 1964 celebrated its 51st anniversary. Originally pioneered by President John F. Kennedy and called for just a year earlier on June 11, 1963 in his Civil Rights Address, delivered from the oval office. In the wake of President Kennedy’s assassination in late November of 1963, his successor, Lyndon Johnson put his full support behind the passing of the act as not only the needed legislation that it was but also as a eulogy to President Kennedy. 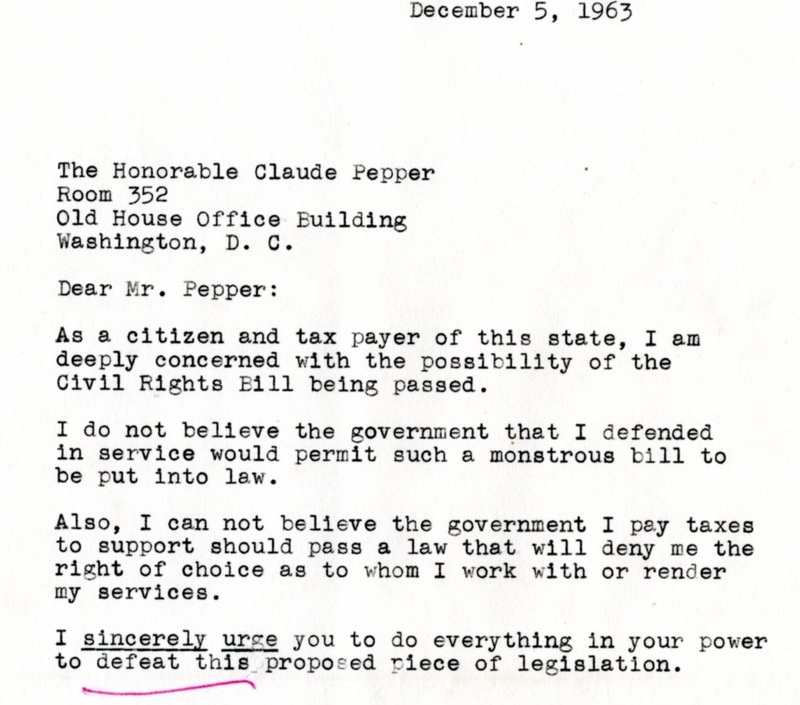 President Johnson was aware that the Civil Rights Bill would face resistance in the solidly Democratic South, however, there was one Democrat in the State of Florida with a long history of supporting progressive legislation; Claude Pepper. Early in his career while a member of the Florida House of Representatives in 1929, Pepper alone, voted against a Florida State Legislature resolution condemning First Lady Lou Henry Hoover’s White House invitation for tea to Mrs. DePriest, the wife of the first black congressman since Reconstruction. 35 years later, Claude would again take a stand that many in his state deemed unpopular, and given that his constituency was well aware of his record, the old statesman was inundated with mail correspondence urging him both toward and away from a vote for the Civil Rights Bill. These letter excerpts, both for and against the Civil Rights Act of 1964, are great examples of the political currents that flowed through the country during the 1960’s as the initial large scale push for Civil Rights in the United States was reaching its height. The correspondence below is dated mostly from February of 1964, when the voting for the act took place. A firm believer in voting with one’s conscience, Pepper knew that the choice was clear. When the final votes were tallied, the Civil Rights Act of 1964 received zero votes from members from the Deep South and very few from those states on the periphery. 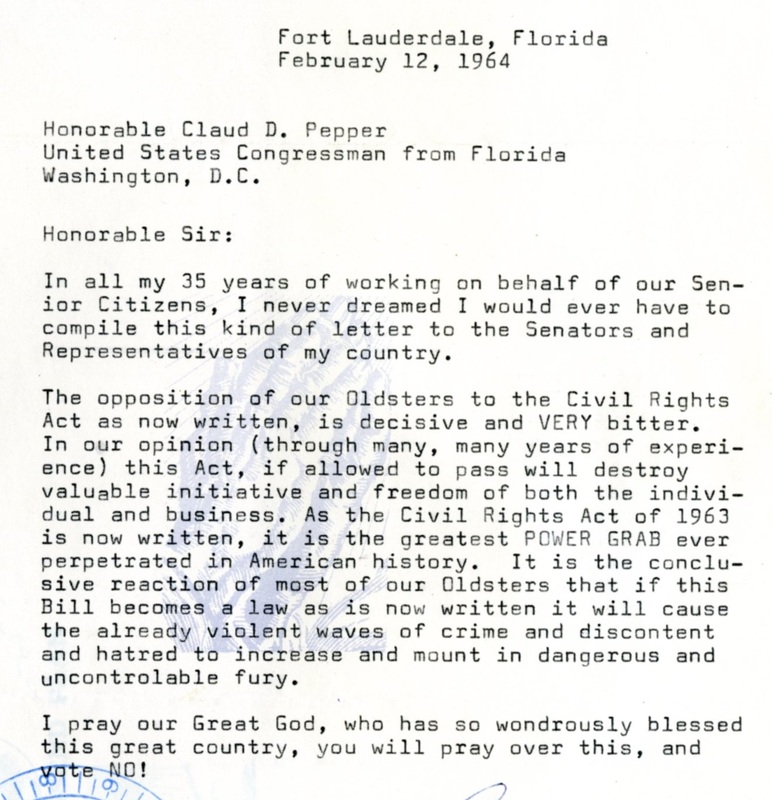 The only vote in favor of final passage of the Civil Rights Act of 1964 from Florida was by Claude Pepper. The following year saw the passage of the Voting Rights Act of 1965 and ‘yes’ votes from six of Pepper’s colleagues who had voted ‘no’ the previous year. 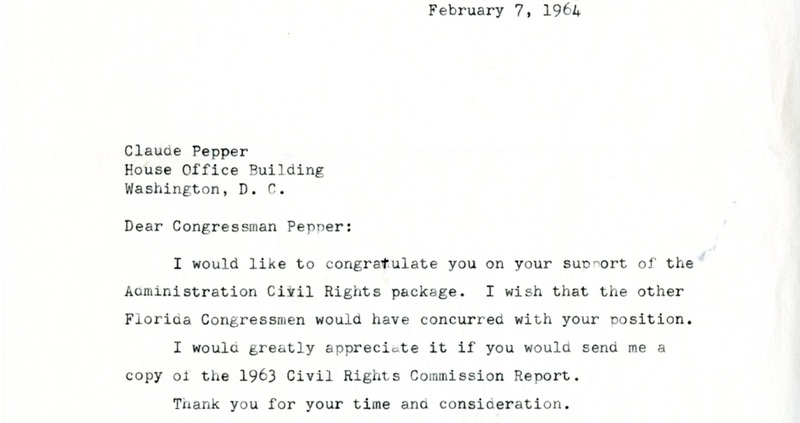 Pepper realized the significance of extending civil rights to all Americans, and consistently supported such legislation throughout his years in the U.S. House of Representatives. For researchers interested in taking a closer look at Claude Pepper and his record on Civil Rights in the United States, please visit the Claude Pepper Library and Museum, Monday through Friday 9AM-5PM.